Since its first confirmation in Cayuga County in 2016, New York soybean farmers have a new pest to be leery of, the Soybean Cyst Nematode (SCN). SCN is considered the number one pest of soybeans globally, causing yield losses of approximately 100 million bushels annually across the U.S. alone. These high yield losses are due to the rapid and highly productive life cycle of SCN (Fig. 1). It’s true that those yield loss estimates don’t relate directly to our current situation in NY at the moment, but the best way to avoid these potential losses is to gain a better understanding of SCN populations statewide. Fortunately, a network of pathologists and nematologists across the US who have been dealing with this potentially devastating pest for years have come together to fight as a unified front as an organization called the SCN Coalition. Their website is full of useful information, resources, recommendations and much more, including proper sampling techniques, which labs you can send soil samples to for testing, and best management practices. We highly recommend that NY soybean growers take a proactive approach at identifying and managing SCN while populations are low. And, now is the best time to get out and take your soil samples for SCN testing. Just because it’s only been officially confirmed in one county doesn’t mean it isn’t more widespread, or possibly even in your own fields. And, once established in a field, management can be tricky because this pest has been developing races that have been overcoming the most widely deployed sources of genetic resistance incorporated into the majority of the commercial soybean varieties. Check out this short video for more information on the SCN resistance issue. Since SCN populations are likely low in fields across NY at this time, it’s important to focus your soil sampling for testing on fields with a long history of soybean production, and in areas of those fields that are most likely to harbor populations. 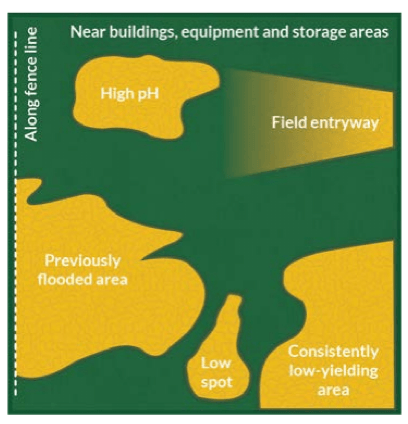 The most high risk areas for finding SCN in your fields include compacted areas such as entryways, areas that are frequently flooded, areas where you have found sudden death syndrome, sections with high pH, or areas of fields that you notice are consistently low-yielding (Fig. 2). 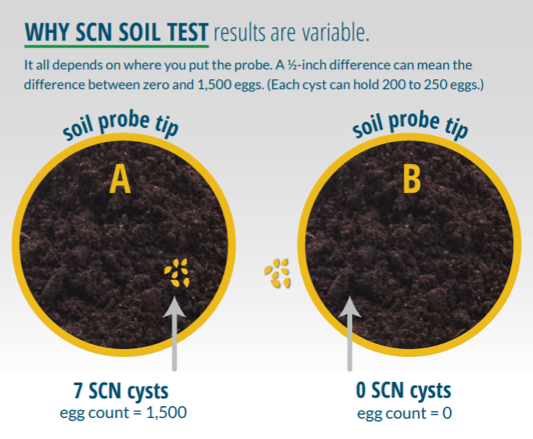 Despite your focused soil sampling efforts, you may get zeros as your test results. 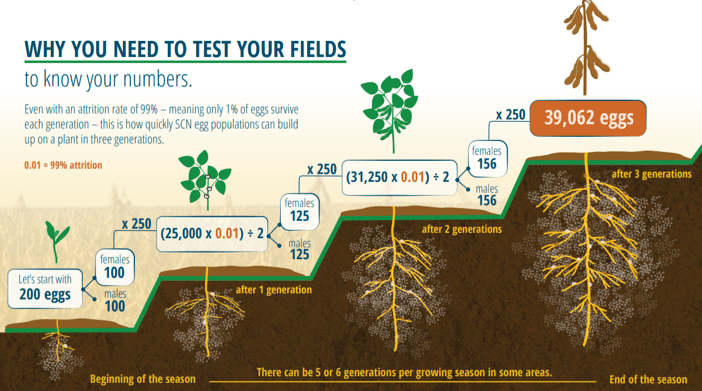 This doesn’t necessarily mean that your fields are SCN-free though, because it can be challenging to detect SCN at low population levels due to the way cysts are distributed in the soil (Fig. 3). Zeros are good, but it doesn’t mean you shouldn’t continue to sample annually. Although SCN management is getting more challenging as resistance is breaking down, we recommend an integrated management approach. This would involve annual testing of your fields to know your numbers (and eventually your races of SCN), rotating SCN resistance sources in your soybean varieties, crop rotation with non-host crops (corn, wheat), and utilization of nematicidal seed treatments (Fig. 4). Now is the ideal time for you to collect soil samples for SCN testing. Focus on high-risk areas outlined above, and collect 15-20 1-inch-diameter core samples, 8 inches deep from within soybean rows near the roots. Mix the cores well and send to an SCN testing lab, following specific packaging instructions from individual facilities. Many options are available for SCN testing facilities, including public and private labs. Testing prices on average are around $25-$28 per sample at most SCN testing labs. The Cornell plant disease diagnostic clinic offers this service, or you may consider one of the most highly recommended facilities which focus entirely on SCN, such as Midwest Laboratories, SCN Diagnostics, or University of Illinois Plant Clinic. Most private and public testing facilities accept out of state samples. For anyone interested in further, in-depth information on SCN, please check out this hour-long training webinar on the biology and management of SCN from Iowa State Nematologist Greg Tylka.